This minute mite forms huge colonies on the stems of tomato or aubergine plants, which show up as a ‘rust-coloured’ mass which spreads along the stem. It belongs to the family Eriophyidae, which are characteristically tiny and ‘worm-like’ in appearance. Other species in the same family cause russetting on apples and citrus fruits, and form galls on the leaves of plants. Until recently, there were no adequate biological controls for this pest. Trials had shown that Amblyseius cucumeris, Amblyseius californicus and Typhlodromips montdorensis were able to feed on the mite, but that none gave adequate control of the pest in glasshouse situations. The best results were obtained from the use of Amblyseius cucumeris CRS sachets (Amblyline cu CRS), which slowed the spread of infestation on individual plants but did not stop it. Amblyseius andersoni, a predatory mite recently introduced into commercial production, has now changed that situation. This predator is available in our patented Gemini sachets – Anderline aa, which release several hundred predators onto the crop over a period of several weeks. The Gemini sachets should be hung as high as possible on the plants, so that the predators are released in front of the advancing Rust Mite infestation. Trials in commercial tomato crops have shown that predators colonise the entire plant, and are able to prevent severe damage when used early enough. 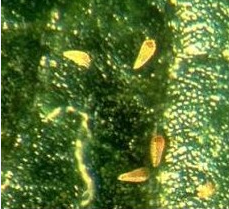 These tiny mites can cause immense damage to plants, and yet are difficult to see, and often not present on the leaves that show the damage symptoms.This is because they occur in the very middle of the growing point of the plant, where new leaves are being formed but have not yet expanded. They feed on this delicate leaf tissue, and as the leaf expands it becomes distorted. 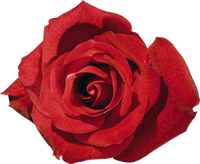 Some types of plants show less distortion, but affected leaves often appear glossy and discoloured. Heavily infested plants can become severely distorted, and infestation can rapidly spread through a crop from an initial focus. The pest can be best controlled biologically with high doses of Amblyseius cucumeris applied onto and around the foci of infestation. Lower rates must be applied around the area of visible damage, as the pest is almost certainly present in lower numbers, even when no damage is yet apparent. Amblyseius californicus has also been shown to offer control, but this is not available for use on outdoor crops in some countries. It is also an expensive option compared to A. cucumeris. Other Amblyseius species will have a side effect on these mites.